Life is great! Busy, but great. I’m really getting a chance to spread my meat-free message. 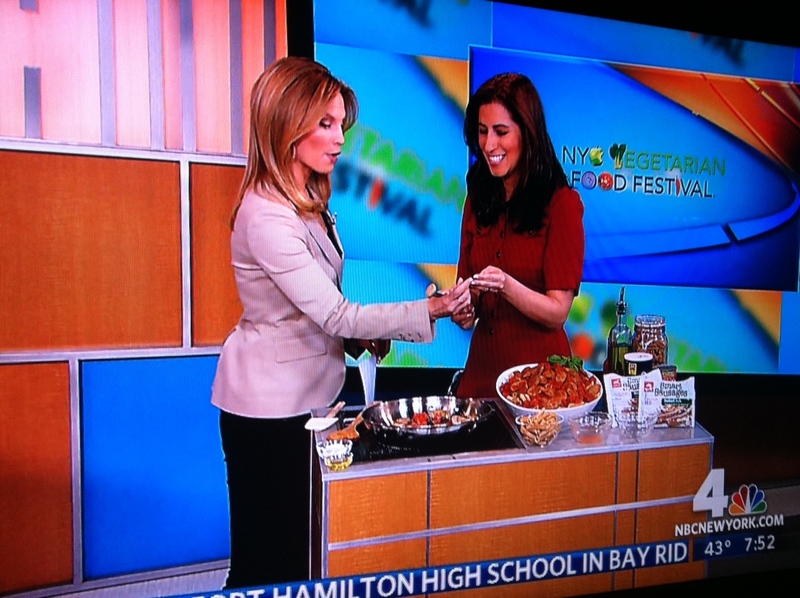 Today I appeared with Erika Tarantal on WNBC’s morning show to show everyone how to make my Easy Penne with Lightlife Smart Sausage (Italian Style). Erika is a vegetarian. She says she hasn’t had any meat since she was 10!!!! She gave up fish by high school & ever since she has been a full-fledged veg. I was so happy to get cooking with someone who was a vegetarian. She was excited too, saying that finally it’s a cooking segment where she could try the food. She said she has eaten meat substitutes before, but this was her first time trying the Smart Sausage and she loved it. Some of the stage crew tried it after the segment too and they loved it! They said they would have never known the difference between this and real, meaty sausage. A great compliment indeed. I’m always so excited when meat eaters try my meat-free food because their reactions are always priceless. They are just blown away because they can’t believe how tasty vegetarian food can be. 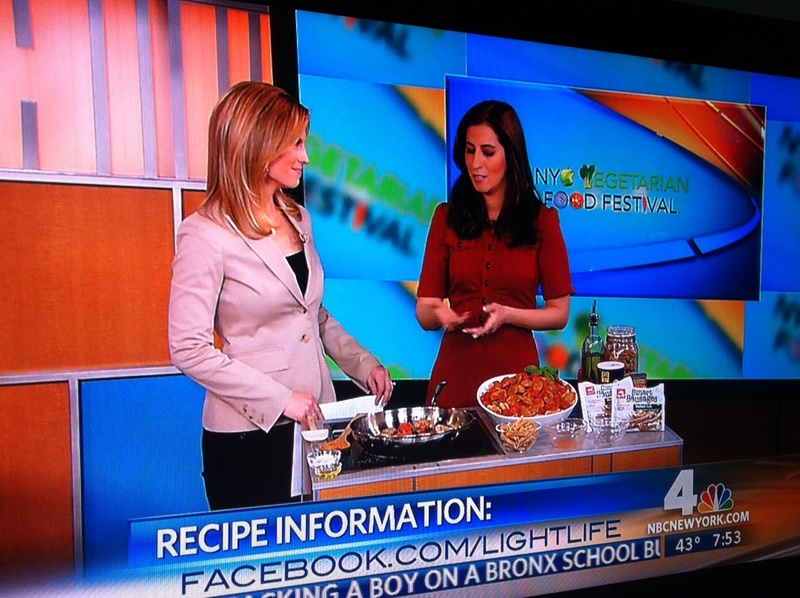 As you see from the picture above you can find the recipe I cooked on WNBC at Facebook.com/Lightlife. I hope you will all make it. It is such an easy recipe, but as I point out in the segment if you want to play around with it and add your favorite ingredients you can add anything you want. It’s really about taking the flavors you love and keeping them around, just without the meat! 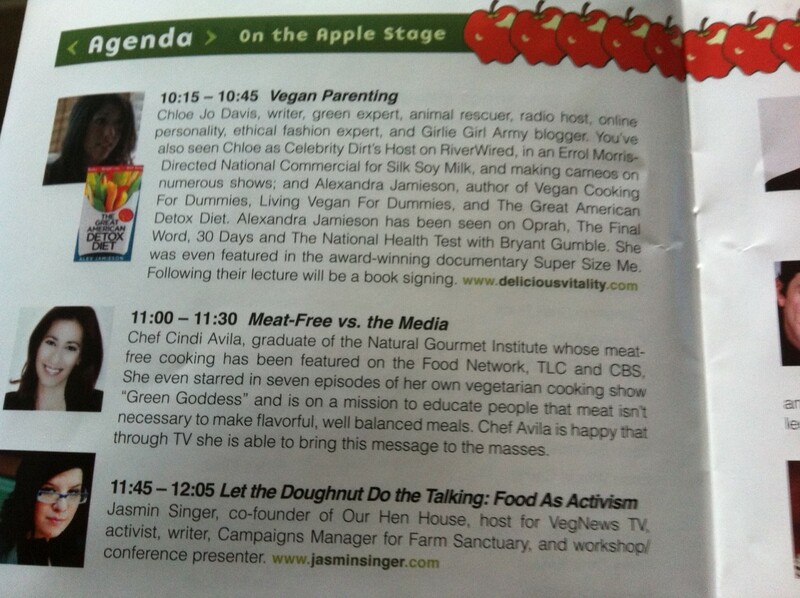 After WNBC I headed over to the first ever NYC Vegetarian Food Festival. Wow what a turnout. 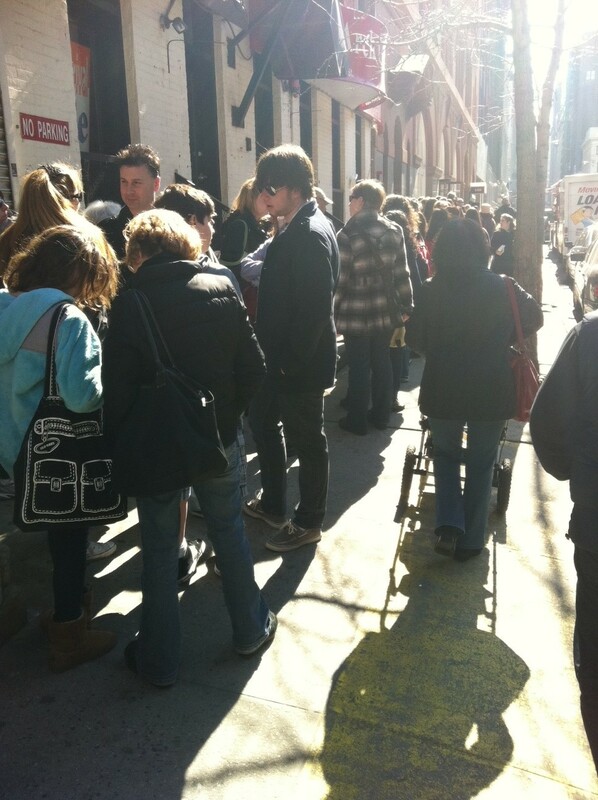 There was a line down 18th Street around 7th Avenue and then snaking down 19th Street. I have never seen a turnout like this for a food festival before. It was a three hour wait by noon! Inside there were tons of vegan food booths giving out samples. It was so yummy to have all these great companies under one roof. I brought my parents with me and they were loving trying all the different foods. 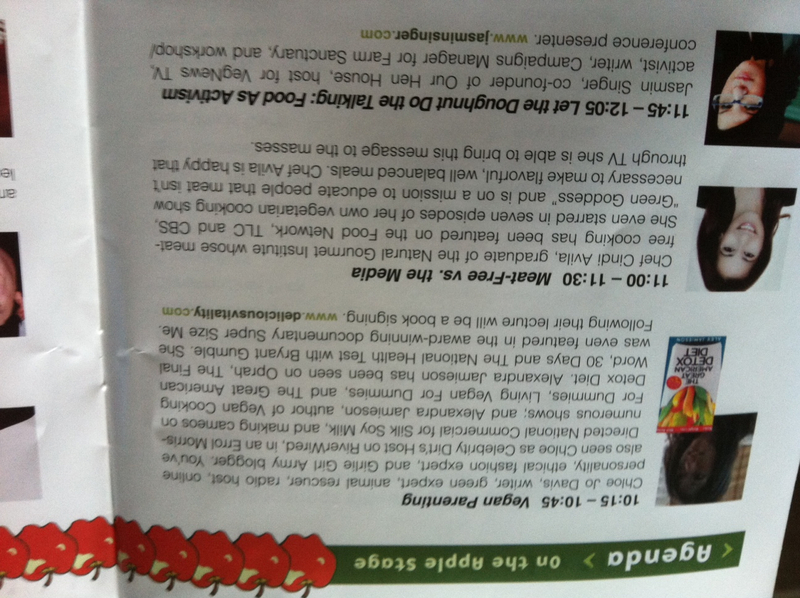 After taking a look around the food hall I headed down to watch the first speakers, Chloe Jo Davis and Alexandra Jamieson. They talked about raising children as vegans. I was especially interested in this topic since I have my own baby (Alexia) now. My favorite part of their presentation was when they said that we aren’t born carnivores. They pointed out that if a baby is in her crib and you put in a carrot and a rabbit, the baby will eat the carrot and play with the rabbit. What a great point! People need to stop using the argument that we need meat to survive. We don’t need meat and a great place to prove this point is with future generations. I know tons more people in Alexia’s generation will be vegetarians and vegans. When she is my age it will be normal to be meat-free! I ended the speech by talking about my goals for the future. Someone in the audience actually asked where I go from here? I told them that I won’t stop until I get my own vegetarian show on TV. I am a determined gal and there is no stopping me. So lookout world. My show is coming to a TV near you soon! BTW I anticipate next year the 2nd NYC Vegetarian Food Festival will be in a bigger space to accommodate the thousands of people who want to attend. If the crowd was this big the first time out, just imagine what next year is going to be like?!? !